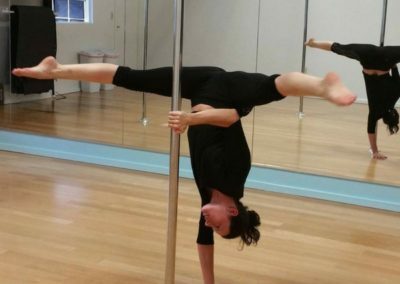 Lauren Forest, who goes by “Lily King” in the pole community, is the owner and lead instructor at Marlborough, MA’s Sky High Studios. 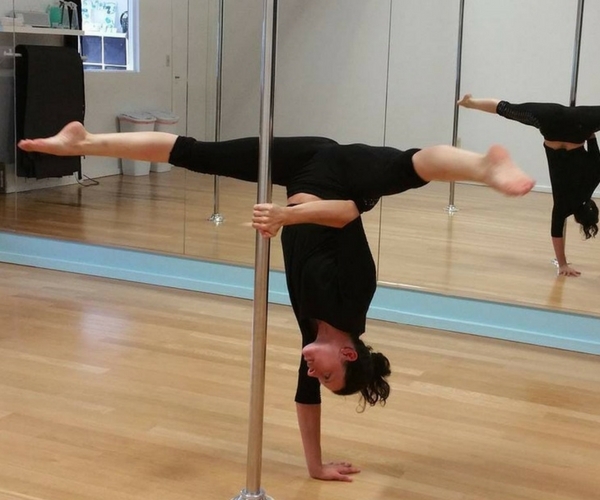 With 7 years of pole experience, Lauren opened her studio in 2013, where she takes great pride in encouraging staff and students to push their personal fitness and self-accomplishment boundaries. Sky High Studios features pole and aerial classes for beginners to competitors, backed by the skill and passion of 17 regular instructor staff and a growing body of diverse students. I was introduced to pole through a bachelorette party for a friend. To be honest, I wasn’t originally excited about going, but once I got there and was able to do a few things no one else in the group could do, I was inspired to see what else I was capable of. When she’s not at the studio, you’ll find Lauren balancing the tantalizing (and rare) opportunities to binge on Netflix (with her kitties on the couch) and craft all-the-things at once. She’s a fan of whipping out decorative bookmarks and accessories, and working on massive “not your grandma’s” cross stitch projects that only the universe knows if she’ll ever actually complete. She’s also a glutton for telling dumb jokes (when you come to the studio ask her why the ghost joined AA), reading and watching documentaries, and sitting on the beach when New England weather allows for it. The Doors are my favorite band. My all-time favorite song by them is “People are Strange” which I believe is also the shortest song they ever wrote. Now you have a fun piece of trivia too. I began to teach Pole Fitness 4 years ago and since then have been awed at how other women challenge themselves to be better, stronger, different, and more comfortable with themselves.